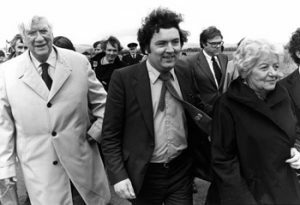 We have through the support of a range of donors created a full-time, permanent John Hume and Thomas P. O’Neill Chair in Peace. 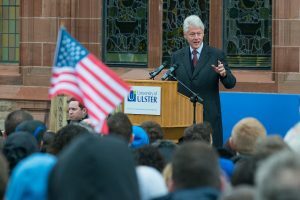 During President Clinton’s visit to Derry on 5th March 2014, Vice-Chancellor Professor Richard Barnett was delighted to announce that the endowment of £3m/$4.8m required to establish this Chair in perpetuity had been successfully raised. This support from donors is testament to the importance of establishing this Chair as a legacy to both men’s outstanding and inspirational contributions to peacebuilding, both locally and globally. PhD scholarships (4 three-year scholarships). It also represents a belief in the need for investment in equipping a new generation of peacebuilders and in making a practical difference to ensuring peace on a global scale. There is an urgent need for further funding, to support the wider INCORE Peace Initiative, which will be led by the Chair, and which in return will very much support its ethos and objectives. The funding will provide the Chair with the scope and tools to develop a dynamic global program which will effect change in a tangible and practical way.